April 2014 – Ben Boyle lives here! Time to share some progress! The Maya Workshop at AnimationMentor is excellent, there is plenty to learn! I’ve been playing with lighting, shading and rendering this weekend. It’s good to get the basics down and overindulge a bit now so I can focus on character animation when the time comes! It probably won’t catch on as an ANZAC Day tradition, but last year I posted a comparison of me playing Hey Ya! on the bass from 2012 and 2013. 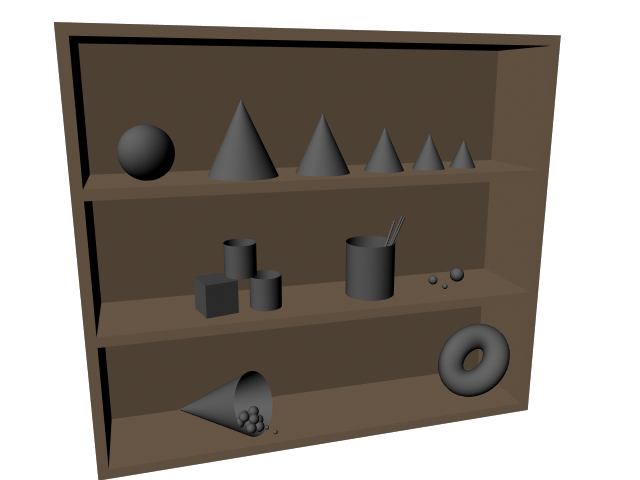 Week 1 Maya workshop exercise was to create the objects on this bookshelf. Was a good introduction to moving objects (and the workspace) around in Maya. Word of the week: nurbs.